Shipping | Hardy Buoys Smoked Fish Inc.
Hardy Buoys has partnered with a freight forwarding company to ship your fish home from our facility to your door. 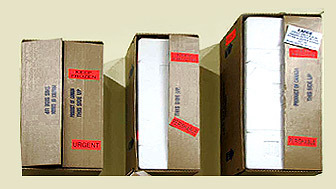 The average sized shipping box is 36″ x 14″ x 11″. You will need this dimension to obtain a quote from Greyhound, or simply phone Hardy Buoys Toll Free 1-877-949-8781. We will be happy to provide you with an estimated cost. You can go to www.shipgreyhound.ca to get an idea on pricing. Contracted to a freight forwarding company. Shipping rates vary depending on destination and shipping weight. Please phone Toll Free 1-877-949-8781 for an estimate. Prices quoted for shipping are approximate. They do not include the cost of product, processing, packaging, or any applicable taxes and duties. Deliveries to rural areas may require more time and may be more expensive.